Buying a home with no money down allows a home buyer with little to or no deposit by using zero down home loans that requires no down-payment. These 100% financing home loans are much rarer today than a decade ago, but there are several no down payment loans you may be able to qualify for if you meet the guidelines. Plus, there are many low down payment zero down house loan options for first time home buyers too. Are zero down mortgage programs making a comeback? By now, most consumers understand that there is a myriad of expenses when it comes to buying a house in this country, so having the ability to obtain a mortgage that requires no down-payment is very appealing. Let’s get you educated on how to buy a house with no down-payment in 2018. There are many new opportunities for 100% home loan financing from competitive mortgage lenders and banks that are advertising attractive fixed interest rates. Let’s explore the 2018 real estate financing marketplace while breaking down exactly how to buy a house with no down-payment without breaking the bank. Now is an excellent time to buy with zero down home loans. Some new home buyers are securing 100% mortgage financing and many are finding loan opportunities with a limited amount down required. Sales of existing homes are rising in 2018, supply is low in many markets, and houses are appreciating in value. Plus, according to a Zillow report, mortgage rates on the zero down home loans are still low in the 4% range, but are rising. You will probably pay more for a loan next year, so now is the time. However, many people are stopped from buying a home because they are afraid of having to put a lot of money down on a home. But there are ways to buy a home without putting down 20%. Even though the mortgage crash made it harder to buy a home with less down, you definitely do not need to put down 20%. For some reason, many Americans still think you have to put 20% down. This has not been true for decades. This myth may be perpetuated by the fact that you do generally need 20% equity to not have to pay private mortgage insurance premiums. Some people hate the idea of paying PMI, but we don’t think they should. Paying PMI costs the typical buyer $100 to $200 per month. But the up side is that it allows you to put down much less than 20%. We think that it is a bad idea to tie up most of your savings into your home. We like the idea of putting down much less than 20% down and paying PMI if it’s necessary. There are some 100% mortgage financing programs available still that you might consider depending upon your personal circumstances. When shopping online, verify the lenders you are considering offer affordable low-rate home loans with zero down without charging exorbitant closing costs and fees. The fact remains that in 2018 there are more genuine opportunities to buy a house with no money down than there have been in a decade. If you are a military veteran or active duty military, you can get a no money down mortgage with a VA loan. Surviving spouses also can qualify. These zero down house loans are guaranteed by the US Department of Veteran Affairs, and the VA will pay back the lender if you do not pay the loan. Because of your military service, you can get a 100% home loan with zero down and even get closing cost help. You also could get a very low interest rate. VA financing has offered the most competitive zero down mortgage rates for many years. If you meet the VA eligibility, these zero-down house loans appear very attractive. If you are buying in a more expensive region of the country, you can get a zero down home loan up to $636,000. This higher loan amount can be essential if you are buying in NY, CA or HI. The VA program remains one of the only bad credit no-money down home loans available to applicants that meet the eligibility requirements. If you are not a military veteran, you still do have another zero down home loan option. The US Department of Agriculture offers a 100 percent home financing mortgage option. It used to be called a Section 502 mortgage, but also is called a Rural Housing Loan. The good news about these loans is that you do not always have to buy in a rural area. You also can sometimes get a USDA mortgage in many suburban neighborhoods. The goal of this program is to allow low and moderate income home-buyers to buy a home. Many people who get a USDA Single Family Guaranteed Loan often have a good income and live in a traditional residential neighborhood outside of major cities. For instance, some suburbs of Columbus OH meet eligibility standards to get a USDA loan. 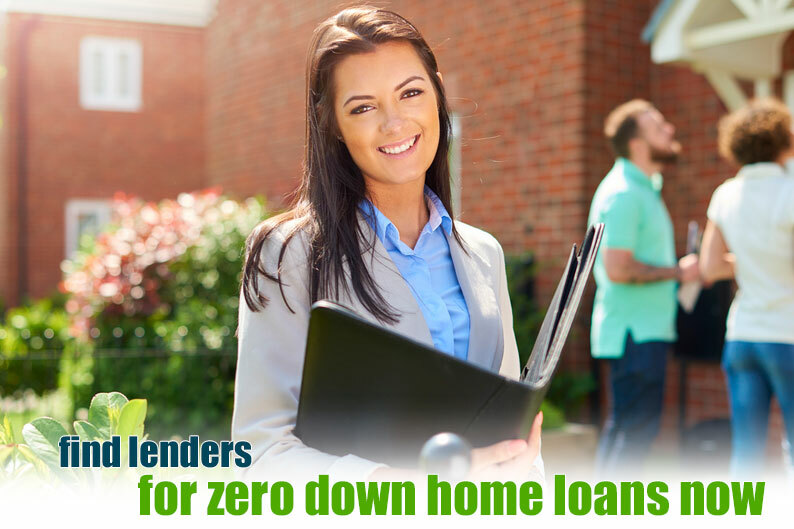 Some of the major benefits of these zero down house loans are that you can often include home repairs in the loan, and you can also buy more expensive homes with the program. The interest rates for the USDA loans with zero down-payment are also quite low. If you have the ability to put down a small amount of money for your home, you will have many attractive options available. Your very best option to put a limited amount of money down is an FHA home loan. These loans that are guaranteed by the Federal Housing Administration require only 3.5% down if you have a credit score of 620 or higher. The standard financing product is not a zero down home loan, but it’s pretty close to it. The minimum credit score on FHA mortgages starts at 500, so there are many chances for people with less than great credit to buy a home in the U.S.
FHA underwriters are very flexible as far as credit scores and down payments. FHA will usually insure the home loan if you have a 620 FICO score if you have sufficient income to pay the loan. They also will allow you to buy a home if you have a foreclosure or bankruptcy at least a year ago. The FHA program could be considered no money down in a way; if you can get a gift from your family, you may not have to put down any money at all. FHA allows financial gifts to be used for the 3.5% down payment. FHA will insure these loans up to $636,000 in more expensive areas. So you can buy a home with an FHA mortgage with only 3.5% down in more expensive areas. In some states, people are getting approved for home buying grants with FHA financing so it turns into a zero down mortgage in many instances. There are fewer no down-payment home loans today than a decade ago. The mortgage crash required many lenders to increase their lending standards. This meant requiring some down payments for home loans. But if you can qualify for a VA or USDA loan, or can get gift funds for an FHA mortgage, you still may be able to get a zero down house loan today. Many potential home buyers think that 100% financing home loans are no more. After the mortgage crash, it is true that 100% financing loans became harder to come by, but they are still out there. In this article, we will describe your zero down payment mortgage loan options. If you can buy a home with little to no money down, you will be able to save your money for fixing the home up or for other needs. As a new house buyer it makes sense to preserve your capital if you can get an affordable home loan with no down-payment. Why Are There Still 100% Financing Loans? Many home buyers wonder why most home loans today require to put money down? It all boils down to the fact that the lender wants to make sure that it is paid back. Research shows that the more money put down on a home, the less chance that a buyer will default. In fact, experts say that the amount put down on a home is even more critical in determining lender risk than one’s credit score. This is why many years ago the standard down payment became 20%. Anything that is below that is considered a higher risk mortgage and requires mortgage insurance, such as PMI. This insurance ensures that the lender will get reimbursed if the borrower does not pay. However, there are still some zero down payment loans available. The USDA home loan has been available for a long time. It is gaining in popularity though because it is zero down and the credit requirements are fairly lax. Does this sound too good to be true? We assure you, it’s true! This program has been used to fund zero down mortgages a million times since 1949. This program is provided by the USDA as a way to help increase rural development by encouraging people to own homes. Studies show that home ownership increases the value and stability of neighborhoods, by and large. To qualify, you can have poor credit, but you need to have enough income to support your home payment and other bills. You also cannot have too high of an income; this is a program for people with lower incomes. The key factor in this program is buying a home that the USDA considers ‘rural.’ However, even though rural areas are targeted, some suburban areas are still considered rural according to the USDA. Many large US cities are not far from many houses that can qualify for a zero down USDA loan. The USDA loan can be even cheaper than zero down too; the seller can pay part of the closing costs. So you do not need to come up with a down payment or most closing costs, in some deals. With many USDA loans, it is cheaper to buy a home than it is to pay rent. You do need to pay a 2% up-front fee that you can finance with the loan; it does not have to come from your savings account directly. The USDA loan is an excellent 100% financing home loan program that people buying in rural areas should strongly consider. Another excellent zero down option is the VA home loan. This loan is an option to people who have at least two years of military experience. Those who are active duty and have at least 90 days of service also qualify. The VA estimates that more than 20 million people in the United States may be eligible for a VA loan, but they may not know they are eligible. Anyone who can get a VA financing should! VA guarantees no money down home loans that have very low interest rates and are usually lower than conventional mortgages. You also do not need to pay a monthly mortgage insurance fee such as FHA and USDA loans. This is truly one of the most affordable no money down home loans out there, and you can put zero down….and the seller can pay part of your closing costs. Lenders will usually allow a lower credit score on a no money down home loan backed by the VA; a typical credit score can be as low as 620. Most people think that FHA loans, while a good program, require at least 3.5% down. This is true in most cases, but sometimes it can be a zero down mortgage. FHA guidelines state that you can receive the entire down payment as a gift, if you have a friend or relative who wants to assist you. So, you do not need any of your own cash to put down on your home, if you have a gift. So technically, this is not a 100% financing loan, but the effect can be the same in some cases. A lot of people actually receive gifts to buy a home, especially first time home buyers. Many parents want to help their children buy their first home, so they help them with the down payment. Another great FHA niche product is the Good Neighbor Next Door Loan. Police officers, teachers, and other public workers may buy a home with only $100 down. That’s not 100% home financing, but its close! There are fewer zero down loan options today than in the past, but the three options above give you a chance to put very little money down when you get your home, including limited closing costs. Take a close look at each loan to see if you can qualify for a $0 down mortgage. Take control of your home finances and research these popular government backed no money down mortgage programs. People who want to buy their own home frequently inquire about a no money down mortgage loan. Having to put up to 20% down makes it very difficult for millions of people to ever buy. Putting no money or very little money down to buy a home certainly makes buying your first home easier. But is it still possible to buy a house with nothing down in 2018? Yes, there are a limited number of no money down mortgages available. Many people think that all 100% house loans went away after the market downturn of 2007 and 2008. It is true that there are fewer of these programs available today, but some remain. Please continue reading to learn more details on this legendary ‘zero-down mortgage’. Lots of potential home buyers lament the fact that down payments are often required to buy a home. Why can’t the lender just fund 100% of the purchase price? The reason is that lenders are in the business to make money, and generally speaking, home owners who do not put money into the deal are more likely to default on the loan. Usually, the higher the down payment, the less risk that the borrower will default. Some lenders even put more emphasis on the size of the down payment than the borrower’s credit score. This is one of the best government-backed, 100% financing options. This no money down mortgage program has been around for decades, but it has soared in popularity recently. It has no down payment requirements, and flexible credit standards. The 100% financing USDA loan is backed by the USDA and helps rural home buyers to get a loan they can afford. It is a type of rural development loan. To qualify, you only need to have the income to support the house payment, but there are income limits. Those limits must be within USDA standards. One limitation on the program is that you must be buying a home that is considered ‘rural’ according to USDA. This does not mean you must buy a home in the sticks; there are some suburban homes near major cities that may qualify. Check with the USDA website to see if your home qualifies. Your real estate agent also can assist you. USDA also allows the seller to pay closing costs, if he agrees to do so. Therefore, you can theoretically get into a home without a down payment or closing costs. Another government-backed mortgage option is the VA loan. This loan requires you to have at least two years of military experience, or 90 days if you are still serving. According to the VA, 23 million people may be eligible for this 100% financing home loan, but some do not know they are eligible. Let’s be clear: If you are eligible for this 100% financing loan, you need to take advantage of it! VA loans are not only a popular no money down mortgage: They also have very low rates and there is no mortgage insurance required. When this loan is compared to other low money down loans, this is the most affordable. So, you should definitely get a VA loan if you have at least two years of military experience. A VA loan has 100% mortgage plans available and allows the seller to pay all closing costs. Lending standards with this no down-payment mortgage backed by the VA are reasonable too; you can have a low credit score between 580 to 620 and still be approved in some instances. The Federal Housing Administration or FHA has low down payment loans of 3.5%. This can be a lot of cash for a home, but there are ways to make this a no money down mortgage. FHA guidelines state that you may receive your down payment funds in the form of a gift from a family member or other eligible down payment gift source. You do not have to have your own cash for the down payment. Many first time home-buyers get help from family for their first home loan, so it always is worth asking close family members if they can help you out. This is technically a 3.5% down loan, but if you have the source for a gift, it can be a 100% financing loan. FHA also allows the seller to pay part of your closing costs, so you can have very little cash out of pocket to close this loan. The FHA also offers the Good Neighbor Next Door home loan. Teachers, police officers and some other public workers may qualify to buy a home with only $100. This is not exactly 100% financing, but who can complain about buying a home with only $100 down? If you don’t have that, you may not want to buy a home anyway. There are not as many no money down mortgage opportunities today as a decade ago. But the above government-backed mortgage loan programs can in some cases be 100% financing loans. Whichever program you choose, you will need to talk with your specific lender to determine if you qualify for no money down or limited money down. Also, credit, income and debt to income ratio criteria vary widely from lender to lender. Please shop around so that you can find the best mortgage loan deal for your first home purchase. 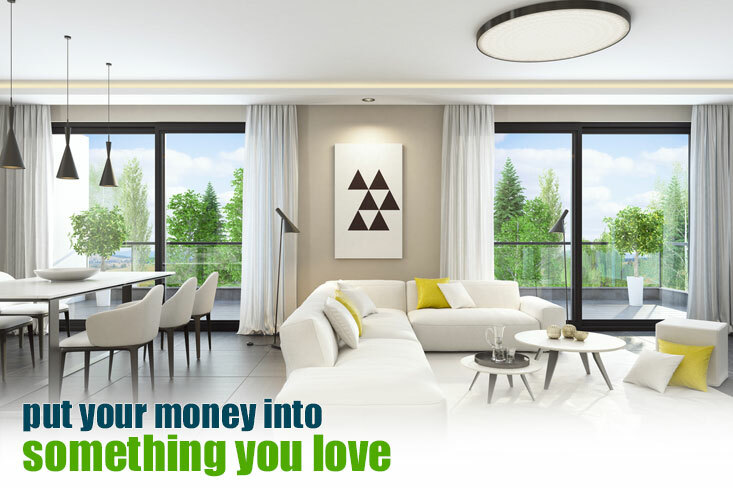 Save Your Money to Furnish Your House with 100% Home Loans with No Money Down. Are you in the market for a new home but do not have a lot for a down payment? You still have some options in 2017! Below are the most common low to zero-down loan programs available for home buyers who want to put down as little as possible. Before we get to those, we should mention that it is definitely possible to buy a home with less than 20% down. It is a persistent myth that you need to have 20% to buy your home. It is true that you will need to have 20% down to avoid paying for mortgage insurance. But it is very much possible to get into your home and stop paying rent and put much less down than 20%. Veterans of the US armed forces or current, active military can get a loan that is backed by the Department of Veteran Affairs. 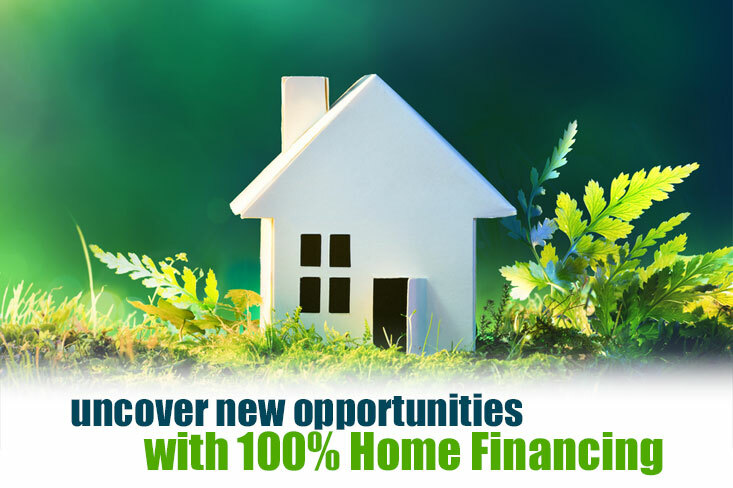 This program allows you to get a home with 100% financing. Private lenders issue these loans, and they are backed by the VA. You do not have to pay for mortgage insurance and the rates are very low. You do need to pay a VA funding fee, but the cost can be rolled into the $0 down home loan. This is one of the few 100% financing loans left in America today. If you can get the seller to agree, you may be able to have him pay part of your closing costs, too. Navy Federal Credit Union also offers 100% financing to its qualified members who buy their own homes. Eligibility for this no down-payment home loan program is only for those who are in the military, some civilian workers in limited circumstances and those who work for the Department of Defense. This is a 100% financing program that works in a very similar way to that of the VA. It does have a lower funding fee than the VA program, however. You may be pleasantly surprised with how low the zero down loan rates are with this program. The US Department of Agriculture has its Rural Development program that is so popular that it may run out of money in some years. This is a 100% financing program that is intended for poor credit, lower income borrowers who are buying properties in more rural areas. You do not however have to be buying property on a farm. The USDA website has a map that shows which homes it will allow to be purchased with this program. Some of the homes may be in areas near major cities. The USDA program is issued by a private lender and is backed by the USDA. You do not have to pay any mortgage insurance. There are some income limits for this type of loan. You should check with your lender to see if your income is not too high to get USDA 100% financing with a $0 down mortgage. It is important to get credit reports from all three bureaus. You will notice that your credit score can vary by many points between the three. This is because some credit bureaus have only certain accounts reported to them. When you see what the variations are on your credit reports, you can investigate which accounts are being reported to which bureaus. We advise paying off the high balance accounts on the bureau with the lowest credit score. This will give you the most bang for your buck in raising your rate before you apply for a loan. This is the most popular and common low money down program in the US. While it is not a 100% financing program, it still requires very little money to put down to get your own home. Many states allow home buyer grants to cover the down-payment requirements for first time buyers. For borrowers who have at least a 580-credit score, you can get into a home with a 3.5% down payment. If your credit score is below that, you need to put down 10%. But if you have a friend or relative who is willing to help you out, you can receive your entire down payment in the form of a gift. This means that you will not need to put any money down at all. FHA also allows you to get help from the seller for closing costs, if he agrees to do so. This may be possible in a situation where the seller needs to get rid of the property and is willing to pay some closing costs to get the deal done. A relatively new option for low money down home loans is the Conventional 97 program offered by Fannie Mae and Freddie Mac. This means that you may buy a home with only a 3% down payment. This is less than FHA currently requires. This program, while it is a conventional loan, only requires a 620-credit score to qualify. This makes it very much in reach for many buyers. It also allows you to pay your down payment in a gift from friends or relatives. It is definitely doable today to get a home loan with putting no money down, or little money down. The best options are for military vets through the VA finance program or Navy Federal program, but the USDA program is also a great deal if you have a lower income and are buying a home in a more rural area. One of the most difficult parts of buying a home for most of us is the down payment. Homes these days are getting more expensive every year, and it is difficult to pony up a hefty 20% down payment. But it is not necessary in many situations to put that much money down. While there are not as many low and no money down mortgages available as 10 years ago, there are still a few great options out there. The purpose of this article is to compare the 1% down and no money down programs that are available as of 2017. In 2016, mega banks Bank of America, JP Morgan Chase and Wells Fargo made news by announcing plans to offer 3% down mortgages. While this is a good deal, there is a new program on the block that is worth your consideration. That is the 1% down home loan offered by Quicken Loans. There are some restrictions and limitations, but this is a viable option for many borrowers who need to put less down to buy their home. The 1% down Quicken home loan is offered as part of Freddie Mac’s Home Possible Advantage program. This is a government-sponsored program that was launched in 2014 that required a 3% down payment. How does Quicken Loans make this a 1% down program? Quicken Loans grants 2% to the home buyer and requires a 1% down payment from the borrower. The 1% down mortgage program will not work for every home buyer. First, it can only be used for purchases – no refinancing is available. Second, the program is only for people’s home residence and they must be a single family or condominium that they will live in. Third, each borrower must have a credit score of 680 or higher. They also must earn less than the median income for their county; this is the hang up for many borrowers. Last, they have to have a debt to income ratio of 45% or less. The buyer also is required to take a free online course on owning a home. Why would people want to consider this mortgage other than for the 1% down payment? Experts say that the terms of the loan are usually better than those offered by the FHA; that government-backed program offers home loans for low credit borrowers with a 3.5% down payment. Experts state that the FHA program has a max LTV of 96.5%, but most borrowers rolled the required up front mortgage premium of 1.75% into the loan. This leaves them with a 98.25% LTV. Thus, people are getting the chance with the Quicken Loan program to put down only 1%, but they are actually getting 3% equity with no upfront mortgage insurance. There also is no mortgage insurance premium required every year with the 1% down program. The 1% down Quicken Loan mortgage is a good option for lower income borrowers who have at least a 680 FICO score. There was a day when almost anyone with a pulse could get a no money down mortgage. Today, it is much harder. It is understood that people having no stake in the home led to a high number of defaults. That said, there are a few no money down options out there. The first is the FHA loan. It is true that you have to have a 3.5% down payment. But many first-time buyers get their down payment from a relative. The FHA allows the borrower to get the entire down payment as a gift. The only requirement is that the person offering the gift must write a letter stating that the money is a gift and does not need to be paid back. If you can get a gift from a relative, the FHA financing can be a good, 100% financing option. You do have to pay mortgage insurance, up front and every year, so it is a more expensive option than the 1% Quicken loan. The FHA home loan is an option for those who have a higher income than is allowed under the Quicken loan program. There is no maximum income under FHA rules. Another option for 100% financing is the USDA mortgage. This program is backed by the federal USDA. 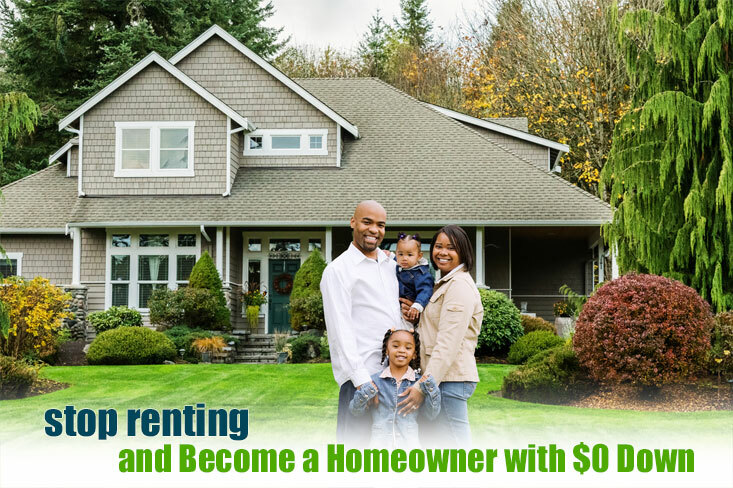 It offers 100% financing and low cost mortgage insurance. Interest rates also are very low. This program also has income limits, so not everyone is going to qualify for it. The other limitation is that you have to be purchasing what the USDA considers a ‘rural’ property. You can find some homes that USDA will underwrite that are actually in suburbs outside some large cities. But some borrowers find that USDA will not work with them on the property they want. So, this program is useful but of no value to some borrowers. The last major 100% financing option is the VA program. This program truly is 100% financing, no money down. But you have to be a military veteran or active duty military. This is one of the best options in the US mortgage market, but it only applies to people who are or were serving in the military. There are several good 1% down and no money down mortgage loans. Which one is best for you depends upon your financial particulars. Talk to your lender today to see which is best for you.